Validated to work with any of the Exo-Flow Capture Kits, the Exo-Flow Multifunctional Magnetic Stand simplifies magnetic bead-based exosome isolation. With space for twelve standard 1.5 mL microfuge tubes when placed in one orientation, or two standard 15 mL or 50 mL conical tubes when placed vertically, the Exo-Flow Multifunctional Magnetic Stand is a great way to maximize exosome recovery while minimizing effort. 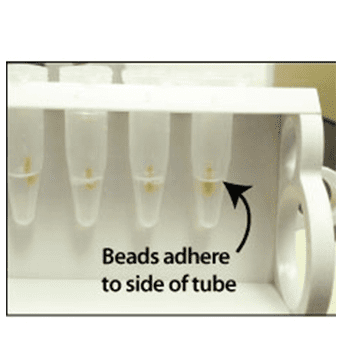 When tubes are placed into the stand, the magnetic beads remain firmly held to the side of the tube closest to the magnet simplifying removal of buffer for washing and elution.